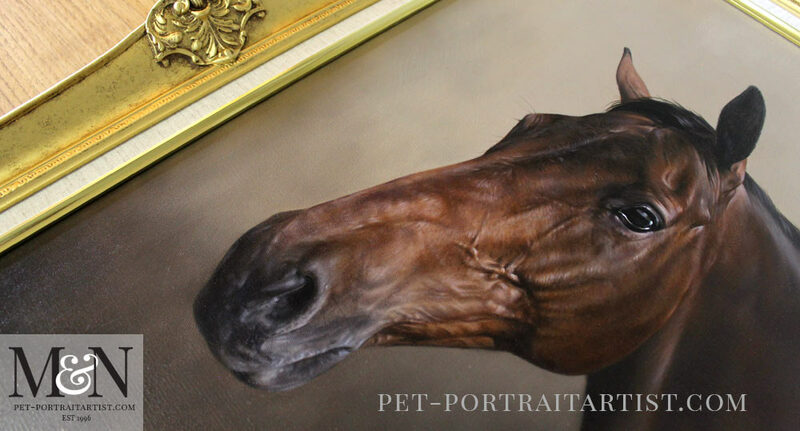 Do You Varnish Your Pet Portraits Oil Paintings? Do you varnish your pet portraits oil paintings? I understand oil paintings need to be left for some time before applying varnish. Would I have to return the painting back to you for varnishing. Would there be an additional cost for this?…. We are always happy to help with any questions. So we replied with the following. We thought that our readers on our blog might like to hear our thoughts and views on varnishing too. The first point is that oil paintings must be completely dry before varnishing. Oil paintings can vary in their drying time depending on how thickly the artist paints. Nicholas uses very thin layers for his work and paints very finely. You can see this quite clearly in the oil painting of the horse Ballycastle King shown below. However even in his case, we would not recommend adding any varnish until the painting has dried for between 6 to 8 months at least. Our paintings are sent out ‘touch dry’ however the oil paint continues to oxidise over the months. So even though we send our paintings out touch dry, there is still drying to be done. Contrary to popular misconception heat will not dry an oil painting! No need to get the hair drier out and think you are helping! Having said this, varnishing paintings is an optional choice for artists these days and we don’t varnish our oil paintings. We know some artists that do varnish and some that don’t. Modern paints are such that they can withstand modern ways of living very well. It is an optional choice. Of course if you have an open coal fire in your home and are constantly wiping down surfaces removing coal dust, varnishing could be an option. Although in this case we would probably recommend framing under glass instead. If you live in a modern, centrally heated home, there shouldn’t be any problems whatsoever. If you find stubborn particles of dust / lint which stand out on the dark areas of paint, we actually recommend using scotch magic tape to dab off any specs of dust. ​Looking back to the days of the old masters, things were very different with regards to varnishing. Varnishing over the years has been used in somewhat fashionable ways, more as an aesthetic function. For instance, some varnishes gave the surface of the painting a high gloss sheen, other varnishes gave a very matt appearance to the paintings. The favour for each type of varnish went in and out of fashion over the years as different types of varnish were invented. Using varnish also deepened and enhanced old fashioned pigment colours. As previously mentioned however, modern paints are so much better these days. Thankfully without any lead in them! If you would like to read more about varnishing an oil painting and seeing exactly how to do it we would recommend reading the Windsor and Newton webpage for varnishing an oil painting. Although artists all use different types and brands of paints, Windsor and Newton are one of the leading paint makers and the information they have regarding vanishing is second to none. 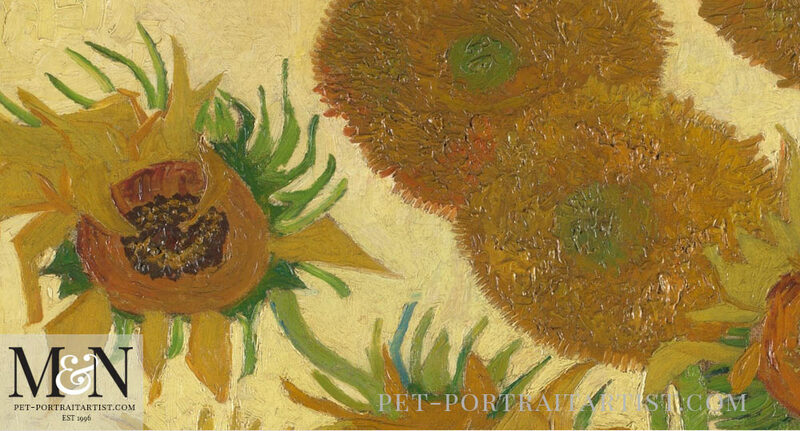 Pictured below is a close up detail of Vincent Van Gogh’s ‘Sunflowers’ as seen in the National Gallery in London. One of four paintings of Sunflowers that Van Gogh painted in 1888. Van Goghs intention was to decorate his artist friends room (Paul Gauguin) with these paintings in the so-called Yellow House that he rented in Arles in the South of France. He and Gauguin worked together in Arles between October and December 1888. In the beginning varnishing would have enhanced the sunflowers colours, however varnish yellows over the years. The National Gallery’s restoration team are involved in conserving paintings and you can read about The National Gallery Restoration process on their website. There is a big difference between varnishing a painting and oiling out a painting. They are two very different things. We mainly use the oiling out method. If we need to deepen very dark black colours, this is the perfect method. Often dark colours can sink into the canvas and dry fairly matt. Although varnishing can help to some extent, it won’t fix the issue completely. So using the oiling out method, we employ a clean brush, using linseed oil, we brush it very thinly over the entire painting. It is very important that the painting is fully dry at this point. If you find that you have put too much linseed oil on the painting you can remove some of it with a lint free cloth. Using the same method, artists often oil out during the painting process too. Oiling out resaturates the paint allowing a new layer to be added with ease. 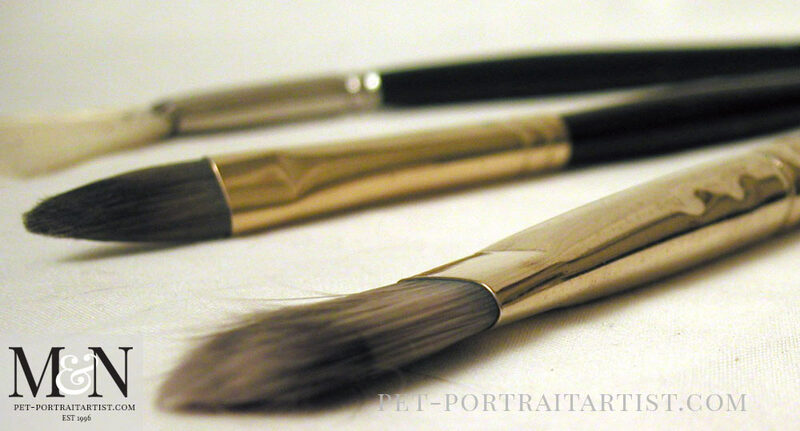 Oiling out may not be needed if you are working on a white or light coloured painting with light tones and hues. However very dark backgrounds or black dogs for instance, could possibly dry very matt. So adding a layer of oil over them can bring back their lustre. Varnishing your oil painting after 6 to 8 months….. If you have commissioned an oil painting from us and decide you would like your pet portrait vanished after around 6 to 8 months, we would recommend taking it to a local restorer. They will be able to varnish the painting for you. They will have the correct equipment and experience to do so. There are many brands and variants of oil paints on the market and we use a number of the most well known and traditional brands of oil paint for our paintings. So it would be imperative to use the correct type of varnish and we can help you with this information when the time comes. Email us from our dog portraits website at any time. A professional restorer must varnish for you. If not, make sure you have all the tools and equipment nessassary before starting. A dust free environment is essential with windows and doors closed when varnishing. Lay the artwork completely flat otherwise dripping can occur. Paint the coats thinly and evenly otherwise pooling can occur. Employ the use of a cover over the painting like a ‘tent’ once the first coat of varnish has been laid. This means that no dust will either lay or stick to the varnish when drying. Its not an easy job and so for this reason we would recommend a professional to do this for you. Varnishing is permanent. Be certain it is the right thing for you and your painting. Lastly, we hope that you have enjoyed reading and viewing our Art Studio Blog and our Melanie’s Monthly News in June. Why not sign up to our Monthly newsletter accessible at the bottom of our website which comes out on the 1st of each month. Consequently this means, you can catch up on all of the portrait stories and news from our Art Studio! Please don’t forget to subscribe to our Youtube Channel too, share, like and follow our social media and you are more than welcome to comment below, we love hearing from our readers!